36 • ROCK products • July 2018 www.rockproducts.com Mine Mobility infrastructure ad hoc to provide ubiquitous coverage across a mining environment – no matter how large or small it is. And as more connected people, devices and machines join a mine's operations, new cell towers would simply roll in to provide the increased network support required, as well as work with the nodes already installed on the numerous moving and static assets in a mine. With the roving connectivity of a cell tower on wheels, the many moving assets that make up a mine – from equipment to vehicles to people – could take robust connectivity with them as they traveled. The tower would simply follow along, dodging line-of-sight issues caused by large equipment, and seamlessly connecting hot zones to allow operators to maintain unwavering con- nectivity to, communications with, and control over all the "things" that power more efficient and productive operations. Giving a network "wheels" means that even outer-edge communications would be reliable, providing a previously impossible direct connection to an operation's center. Wireless mesh networks are ideal for this type of config- uration across a mine because of their inherent mobility, flexibility of scale and reliability. Wireless Mesh Networks In an industry where short periods of operational downtime can cause millions of dollars in losses, mining operators must be empowered to continuously monitor, manage and control their fleets of high-value equipment, vehicles and personnel wherever they roam. Mine operators can kick-start their organization's journey to digitization by deploying a kinetic mesh network topology. Proven to stand up to the extremes of mine environments, this type of network allows multiple nodes to connect, broaden and strengthen the network where necessary, effectively connecting sprawling open pit and underground mining operations. With the nodes essentially acting as compact, rugged, trans- portable, mini cell towers, virtually anything in the mine's infrastructure can be turned into networking equipment. These high-value assets must be carefully managed to ensure uptime is always optimized, which in turn will maximize production. By placing mesh nodes directly on these vehi- cles, shovels and pumps, the firm can seamlessly link them together – gaining real-time information from each asset's applications on status, efficiency, maintenance needs, and more, even as they move across the rugged landscape. 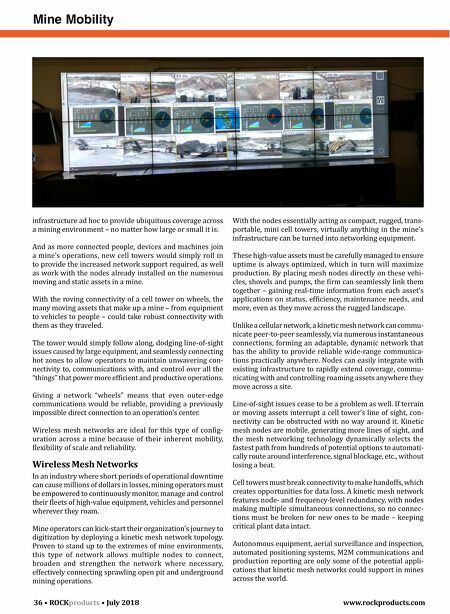 Unlike a cellular network, a kinetic mesh network can commu- nicate peer-to-peer seamlessly, via numerous instantaneous connections, forming an adaptable, dynamic network that has the ability to provide reliable wide-range communica- tions practically anywhere. Nodes can easily integrate with existing infrastructure to rapidly extend coverage, commu- nicating with and controlling roaming assets anywhere they move across a site. Line-of-sight issues cease to be a problem as well. If terrain or moving assets interrupt a cell tower's line of sight, con- nectivity can be obstructed with no way around it. Kinetic mesh nodes are mobile, generating more lines of sight, and the mesh networking technology dynamically selects the fastest path from hundreds of potential options to automati- cally route around interference, signal blockage, etc., without losing a beat. Cell towers must break connectivity to make handoffs, which creates opportunities for data loss. 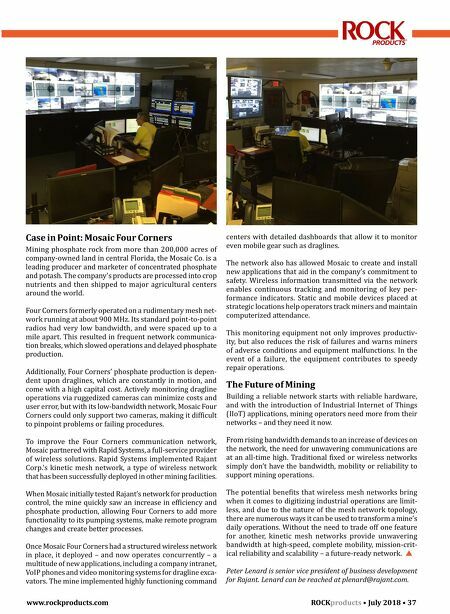 A kinetic mesh network features node- and frequency-level redundancy, with nodes making multiple simultaneous connections, so no connec- tions must be broken for new ones to be made – keeping critical plant data intact. Autonomous equipment, aerial surveillance and inspection, automated positioning systems, M2M communications and production reporting are only some of the potential appli- cations that kinetic mesh networks could support in mines across the world.